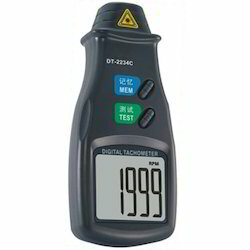 Pioneers in the industry, we offer digital tachometers ( non contact), contact or non-contact combine tachometer dt-2236 and digital contact 2235b tachometer from India. We are involved in importing and supplying a wide range of Digital Tachometers., These are precisely engineered using quality basic material and ensures accurate performance. 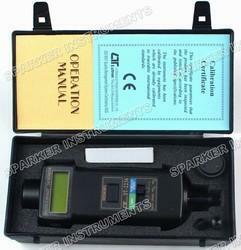 Required in those applications where high speed measurements are needed to ensure accurate readings of the figure. Further, these are available in customized solutions to meet client's requirements and specifications. Digital Stroboscope Tachometer, LUTRON Taiwan, Model DT-2239 A. Range : 100 to 10000 FPM / RPM, 4 Digit Led Display, Microprocessor Circuit, High Accuracy. Digital Stroboscope Tachometer, LUTRON Taiwan, Model DT-2259. Range : 5 To 99,999 R.P.M. 100 To 1,00,000 F.P.M./R.P.M. Microprocessor Lsi Circuit With Lcd Display 5 Digits. Digital Stroboscope Tachometer, LUTRON Taiwan Model DT-2269. Range : 5 to 15,000 F.P.M./R.P.M. 6 Digit Led Display With Rs-232 & Push Button Adjustments Memory Recall Flash Tube / Xenon Lamp. 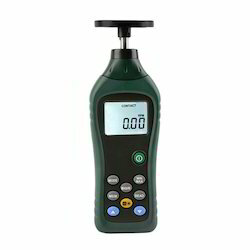 PHOTO TACHOMETER, Model : DT-2234B CONTACT TACHOMETER, Model : DT-2235B Items PHOTO TACHOMETER CONTACT TACHOMETER Model DT-2234B DT-2235B Range 5 to 99,999 RPM 0.5 to 19,999 RPM Surface Speed (m/min.) : 0.05 to 1,999.9 m/min. Surface Speed (ft/min.) : 0.2 to 6,560 ft/min. Resolution RPM 0.1 RPM < 1,000 RPM RPM 0.1 RPM < 1,000 RPM 1 RPM 1,000 RPM 1 RPM 1,000 RPM ≧ 0.01 m/mim. < 100 m/min. Surface 0.1 m/min. 100 m/min. ≧ Speed 0.1 ft/min. < 1000 ft/min. 1 ft/min. 1,000 ft/min. ≧ Display 5 digits, 10 mm ( 0.4" ) LCD. 5 digits, 10 mm ( 0.4" ) LCD Accuracy ± ( 0.05 % + 1 digit ). ± ( 0.05% + 1 digit ). Sampling Time 1 second ( 60 RPM ). 1 second ( 6 RPM ). Time base Quartz crystal . Quartz crystal . Photo Tach. 50 to 150 mm/2 to 6 inch. detecting * Typical max. 300 mm/12 inch distance depending upon ambient light. Circuit Exclusive one-chip of micro- Exclusive one-chip of microcomputer LSI circuit. LSI circuit. Battery 1.5 V AA (UM-3) battery x 4 PCs. 1.5 V AA (UM-3) battery x 4 PCs. Operating temp. 0 to 50 ( 32 to 122 ). ℃ ℉ 0 to 50 ( 32 to 122 ). ℃ ℉ Memory Last value, Max. value, Min. value. Last value, Max. value, Min. value. Size 190 x 72 x 37 mm (7.5 x 2.8 x 1.5 inch). 208 x 72 x 37 mm (8.2 x 2.8 x 1.5 inch). Weight 250g (0.55 LB)/including battery. 280g (0.62 LB)/including battery.